Although there are specialist events for experienced dancers, barn dances and ceilidhs are normally fun and light-hearted events for everyone to enjoy, regardless of age or ability. Circle dances, longways sets, squares and even a waltz for couples - there can be plenty of variety, and the opportunity to meet a new partner each time through a dance. Our 'caller' will explain all the moves fully, working with a radio microphone to help the dancers on the dance floor itself. Don't worry about getting it wrong, we won't tell you off! The main thing is to enjoy the barn dance. We use 'Equity' actors as our main callers as they are keen to make every thing work as a whole performance, rather than getting bogged down with the technicalities of making every move perfect. Please feel free to call or email if you would like to discuss options and suggestions for your event. As well as the dance itself, how about some acoustic (unamplified) music first, to welcome guests, or your own recorded music played afterwards through our sound system - even a full disco?! Buy using the same equipment we can save you money, as well as preventing the hassle of needing to strike down one rig and set up another half way through the evening - or having it all look like a rock concert! 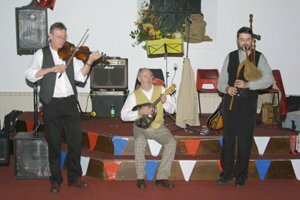 Instruments vary from the period, such as English medieval bagpipes and hurdy gurdy, through to the traditional fiddle and squeeze box - even modern keyboards - anything which can provide a full and lively sound. Tunes come from the traditions of England, Scotland, Ireland, America and the Continent - with a few of our own thrown in as well. As with the instruments, the aim is to get the best sound for you. A barn dance or ceilidh can provide a chance for everyone, regardless of age and ability, to have a good time. Dances are chosen to challenge but not baffle. We assume that you are not coming along as an expert, and don't want to leave as one, either. Experience is definitely not a requirement. Everything is covered by our unique 100% full money back guarantee - we know you will remember the performance for the right reasons, and have the confidence to give you a firm promise. Fine words and assurances carry little weight unless supported by a concrete pledge. Contact us now for more details, or free suggestions and proposals! Please feel free to call or email if you would like to discuss options and suggestions for your barn dance or ceilidh. As well as the dance itself, how about some acoustic (unamplified) music first, to welcome guests, or your own recorded music played afterwards through our sound system - even a full disco?! Buy using the same equipment we can save you money, as well as preventing the hassle of needing to strike down one rig and set up another half way through the evening - or having it all look like a rock concert! Barn dances can provide a chance for everyone, regardless of age and ability, to have a good time. Dances are chosen to challenge but not baffle. We assume that you are not coming along as an expert, and don't want to leave as one, either.